Star TSP100ECO - Thermal Receipt Printer, Auto-cutter, USB Interface. Includes USB cable and power supply. Color: Gray. Also known as TSP143IIU GRY US. The Star TSP100ECO, the world's first ECO POS printer, further extends the legacy that is the TSP100 futurePRNT. The TSP100ECO supports Star's commitment to being ecologically responsible. 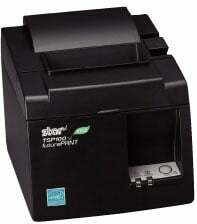 The TSP100ECO electronics has been designed with an advanced power management circuitry which allows any user to reduce his printer current consumption by up to 75% compared to standard Star printers. Developed with smart paper management features, the TSP100ECO is designed to minimize the environmental impact of point of sale printing. We use this in my studio for purchases made by customers. It was so easy to set up and was in use within 10 minutes of receiving! Thank you! This product is being used for a photo kiosk as a receipt printer. It works great. Saves paper compared to our previous printer. The Star 39464011 is also known as Star Micronics	STA-39464011	.